Celestial mechanics have been a major scientific Celestial mechanics have been a major scientific quest for centuries as well as a constant source of fascination and inspiration for mankind. Our senses are aroused as we gaze at the celestial mystery and serene beauty of the Moon. “The Moon has a face like the clock in the hall” wrote Robert Louis Stevenson in one of his poems, finely insisting on the undeniable connection between time and space. GRAHAM celestial manual flying Tourbillon, called Geo.Graham The Moon, which features a perpetual moon retrograde function, embodies the mastery of astronomy applied to high-end watch making. His head up to the sky, George Graham had a great love for observing the Moon while creating his time machines. He spent lots of his time staring at the universe and finding many solution to his mechanical watch making dilemma. Friend of the astronomers, he worked on Sir Newton’s theories of gravitation to elaborate very precise mechanisms combining the magic of the sky and watch making science. Over the years, the Moon has remained an object of curiosity which has greatly influenced life on Earth. It has helped to determine physical locations, to track time and more generally to develop mathematics and science. People switched from simply watching the time pass by, to the use of time as an inestimable travelling tool. Geo.Graham The Moon is a history making celestial representation. Its name pays tribute to the GRAHAM tradition and heritage descending from George Graham who engraved his signature on each of his exclusive creations since 1695. It is a truly unique watch that combines a flying tourbillon with a high-precision retrograde moon-phase perpetual function, the cycle being calculated on the Moon’s exact synodic period for a duration of 122 years. At the end of each synodic period, the retrograde mechanism ensures that the Moon jumps back to the beginning of a new moon-phase cycle. 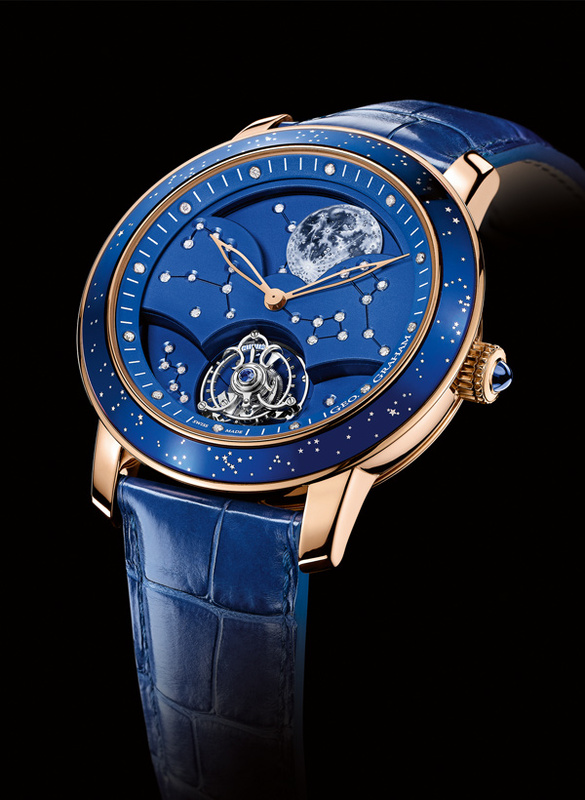 Big in appearance, our Moon only weights 0.07 grams and is hand-painted by local craftsmen in Le Locle. To avoid any damage on the lunar disc and attenuate the retrograde fall, a double absorber system has been developed exclusively for GRAHAM by Christophe Claret in Locle. The synodic period equals 29 days, 12 hours, 44 minutes and 2.9 seconds which corresponds to 2’551’442.9 seconds. Once correctly set, this high-precision moon phase will only require adjustment once every 122 years by a single push on the corrector! Scientists such as Isaac Newton or George Graham have made major discoveries as they realized that combining astronomy and time keeping would lead to remarkable advancement. The main difficulty of the watch lies in the delicate and complex flying Tourbillon. It challenges Newton’s law of gravitation and also pays tribute to his remarkable findings. The Geo.Graham tourbillon rotates on a ball bearing to substitute rolling for sliding friction. Our movement is coated in blue and adorned with constellations of 45 diamonds (0.24 cts) (flange collar: 11 diamonds, dial: 34 diamonds) such as Camelopardalis, Perseus, Cassiopeia, Ursa Major, Ursa Minor and at the centre becoming the North Star’s position. 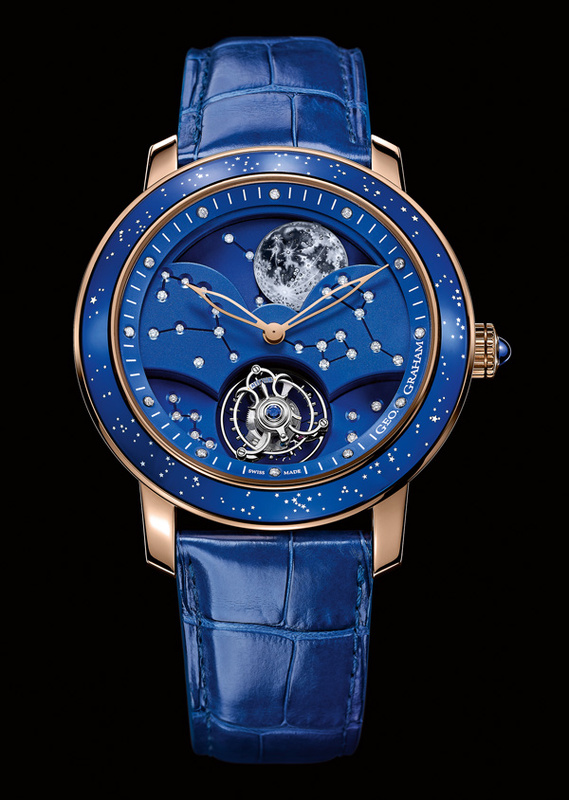 To magnify the moon phase, the pink gold (18K) case with faceted horns is crowned with a Milky Way sapphire painted bezel. It offers you a unique view of the universe through a refracting telescope. 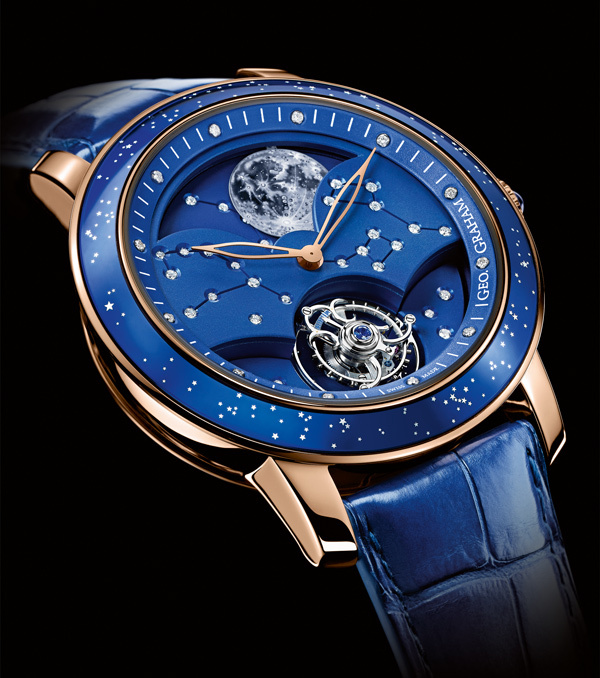 Geo.Graham The Moon is the ultimate representation of the association of astronomy and extraordinary watch making. 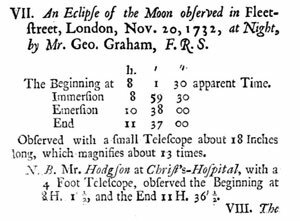 It pays tribute to the early 18th century which saw the creation of new measurement instruments by George Graham for his friend Edmond Halley and the Greenwich Royal Observatory in London. Renewal, mystery, intuition, wonder, balance, fertility; this is what the Moon and stars refer to. Combined with our rich heritage it is also what will exude the Geo.Graham and its constellations of diamonds.